At Turkey's founding as an independent state, Atatürk embraced the European ideals of the age in a way that no Ottoman sultan had ever imagined and at his death in 1938, Anatolia looked and felt drastically different than it had at Turkey's founding in 1923. Indeed, Atatürk not only embraced European values, but emulated them. Modelling the new Turkic republic on the European states of the day, the "Immortal Leader" adopted European legal codes and replaced Ottoman institutions to resemble those of Europe. Central to this nation-building project was Atatürk's wholesale adoption of the same European-style nationalisms that were reshaping Europe. As David Fromkin sadly narrates in A Peace to End All Peace, Turkey was not alone in this endeavor, but was undoubtedly the most successful. Unlike other nation-states carved out of the former Ottoman Empire, the Turkish nation-state was not designed by Europeans, but by Atatürk. Building atop the nationalist ideology of the Young Turks who preceded him, Atatürk carved Turkey out along the same nationalist lines that had come to shape those communities in the Americas and Europe to which Benedict Anderson has referred as "imagined." As one of the first nationalist movements organized against imperialist power, Atatürk brought together the peoples of Anatolia as Turks, romanized the Turkish language, worked to establish nationalist narratives of a shared tribal past, and sought diligently to "Turkify" the Ottoman institutions that had previously governed the Anatolian heartland. An ardent admirer of the French Revolution, Atatürk assembled Turkish nationalism along French lines, an educated, noble project built in the name of modernity, progress, and Enlightenment rationalism. Indeed, many of Turkey's liberals have come to denigrate the Turkish nationalist project as "Jacobin," inferring that just as French revolutionists reached particularly troubling and misguided excesses, so do some similarly self-avowed Turkish nationalists. 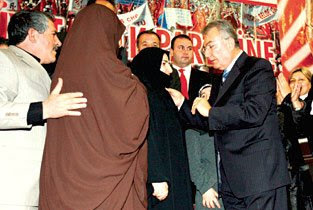 CHP leader Deniz Baykal places a CHP pin on a woman's chador this past November. Baykal proclaimed that no Turkish citizen should be discriminated against based on their attire, a reversal of his party's staunch political and legal opposition to constitutional amendments made just last January to allow covered women to enter university under certain conditions. Although CHP affirmed these dogmas in its party convention this past April and amidst the AKP closure case, it seems the party has turned an about face ahead of upcoming local elections. For example, in a most controversial and stunningly surprising move, the party has endorsed opening CHP membership to female candidates and party members who wear chadors. In Baykal's words: "It is not right to discriminate against people because of what they wear. It is not right to make deductions about them based on their attire." The move is particularly bizarre given that the chador is in many ways more controversial than the headscarf, although the debate about Islamic garb and politics is quite complicated. (See Mustafa Şentop's discussion of the chador initiative.) However, polls revealed the political acumen behind such a move, which is surely designed to capture religious conservatives and perhaps even some liberals who have long been disenchanted with Baykal's CHP. Some liberals praised the move as progressive, and the opening was hailed by Joost Lagendijk, co-chairman of the EU-Turkey Joint Parliamentary Committee, as a welcome step forward. "Little time left before second republicanism," the Taraf daily announced on its front page yesterday, implying that the secularist politician may set Kemalism aside and turn to a new understanding of republicanism. Star's [Mehmet] Altan shared the same belief, saying that Baykal's new move stands as a litmus test for his commitment to becoming a new type of republican or, in other words, a next-generation liberal. "When the CHP received a harsh defeat at the hands of the AK Party in the July 22, 2007 elections, party officials pointed to Baykal as the reason for the failure and accused him of turning his back on second republicanism. Second republicanism means to make the republic more democratic and save it from Kemalism. The CHP leader is going through self-criticism and heading toward second republicanism," he noted. T]he “chador initiative” has provoked enmity within the CHP. Baykal’s call for a critical reflection on the party’s past angered more radical voices. Necla Arat, a parliamentary deputy from Istanbul and one of the fervent advocates of the headscarf ban, disparaged Baykal. She said that “criticizing practices during the era of Ataturk and Ismet Inonu [the second president of Turkey] because of ‘one-party-rule’ is unfortunate. My friends and I have started wondering whether the party is betraying its heritage [reddi miras].” Scores of other CHP deputies reportedly share Arat’s opinion (Hurriyet, December 4). A rather surprising attack on Baykal came from the leader of the Nationalist Action Party (MHP), Devlet Bahceli, who said that this issue was, in fact, a non-issue and did not correspond to the real problems of the people. He said, “As part of the Greater Middle East Project, there is an attempt to shape Turkish politics through moderate Islam… The Right pillar of moderate Islam is the AKP…Is there an attempt to erect a Left pillar of moderate Islam through this opening?” (Anadolu Ajansi, December 9). Baykal issued a written response to Bahceli, in which he drew a distinction between a legitimate right to certain religious freedoms and moderate Islam as a political project. Baykal attacked Bahceli by saying, “only those who either abuse religion or come from a tradition of setting political traps [referring to the MHP’s controversial role in urging the AKP to pass the constitutional amendments on headscarves] will dislike this [the CHP’s defense of religious freedom]” (ANKA, December 10). Baykal indeed took a bold step by opening one-party rule to debate and indicating that the CHP would defend religious freedom, but there are grounds for being skeptical about the prospects of the “chador initiative.” As political scientist Bekir Berat Ozipek says, having ruled the country single-handedly during the one-party-era (1923-1950), the CHP has not been able to adapt itself to competitive electoral politics since Turkey moved to multi-party rule in the 1950s (Today’s Zaman, December 8). Indeed, the CHP’s critical distance from the masses and their lifestyles and its modernization project of transforming Turkish society have shaped the identity of the party’s core grassroots. Therefore, even if Baykal’s intentions were sincere, many analysts like Ozipek are skeptical about the CHP’s ability to transform itself from a statist party to a liberal party embracing human rights and religious freedom. Whether sincere or not, if Baykal's recent gamble fails in March elections, it will certainly damage his leadership of the party, leaving him vulnerable to be challenged by Haluk Koç. Key races to watch out for are the Ankara and Kocaeli mayoral races, in which CHP has nominated candidates Murat Karayalçın and Sefa Sirmen. In other news with CHP, the party's continued vow to oppose any attempt by AKP to renew efforts to overhaul Turkey's military constitution has met with opposition from DSP (the Democratic Left Party). While DSP has not allowed women wearing the chador to enter their party, it has announced that it will not support CHP's opposition to constitutional reform, which might well allow for the substantive policy changes to which both DSP and CHP have before been opposed. It was only with the votes of DSP that CHP was allowed to challenge the headscarf amendments at the Constitutional Court. Although DSP's party has been significantly weakened over the years, the party to which Bülent Ecevit jumped has publicly declared its contention with CHP. The Diyarbakır branch of the CHP submitted a report to the CHP headquarters and is supported by all of the 21 provincial party branches from predominantly Kurdish areas. In the report, the Diyarbakır branch suggested that the party's program first name the question the "Kurdish question" and not hesitate to use the term "Kurd." The report's other suggestions include: "The Kurdish identity should be recognized. Instead of being Turkish, being a citizen of the Turkish Republic should be emphasized. Kurdish language courses should be elective courses in primary and secondary education. Universities should open Kurdish language and literature departments. Formulas should be developed for the integration of the outlawed Kurdistan Workers' Party [PKK] members." The CHP in its report on the Kurdish question in 1989 suggested cultural rights -- including education in one's mother tongue -- but was unable to implement its own recommendations. The recent report issued by the Diyarbakır branch of the CHP also refers to the 1989 report and underlines that this report should be revised. Kurdish citizens have a tendency to perceive the CHP as a "Turkish nationalist" party. The CHP's votes since the mid 1990s started to decline in Kurdish-populated areas. In the 2002 general elections, they were next to nothing. Baykal, during his visit to Diyarbakır this summer, faced protesters. Sezgin Tanrıkulu, the former chairman of the Diyarbakır Bar Association, said the CHP's new initiative concerning the Kurdish question is not the talk of the town at all. He noted that the CHP has long had no influence in the region and has therefore not been able to revise its own 1989 report. "The CHP does not represent anything in the region. This report or any initiative can only be meaningful if the party is able to establish a relationship with Kurds based on trust. For now, the CHP says one thing in Diyarbakır and the exact opposite elsewhere," Tanrıkulu underlined. As with the chador initiative, it is completely unclear as to exactly what CHP is up to, and for good reason. Reconsidering notions of "Turkishness" seems laughable given CHP's opposition to Article 301, and its obdurate defenses of laws restricting freedom of expression. However, as I mentioned on Wednesday, it is of note that CHP is even campaigning for votes in the southeast given the unlikelihood of the party acheiving even the smallest modicum of success. Bizarrely, Baykal recently predicted the AKP to receive over 50 percent of the vote. However, a recent MetroPoll has AKP behind, and the election seems all the more unpredictable because parties are reaching out beyond their traditional bases of support. In the end, will CHP be successful in its effort to expand its reach? If it should fail, will it again reverse itself and become even more nationalist? What will become of Baykal, whose authoritarian leadership over the party has long been questioned? If the party were to make inroads, could it sustain itself, or would its lack of a clear agenda result in fragmentation? What would any of these results mean for the future of Turkey's center-left? Here's a fun blog entry by Sevan Nisanyan about the CHP. If you are at or can get to the point where you giggle at sentences like "O günlerde Ecevit partiyi terketmiş, yerine isim diye Erdal İnönü’nün adı geçiyor. Yani partinin iflah olma ihtimali sıfır." you can conclude that you're adequately informed on the subject. IMHO.